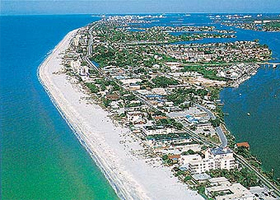 About Indian Shores, Florida - BeachDirectory.Com - The entire Florida Gulf Coast...in detail! Indian Shores is a quieter, less crowded alternative to its larger and better-known neighbors such as Clearwater Beach and St. Pete Beach. It's a great place for vacationers seeking a quiet or family vacation. Originally called "Indian Rocks Beach, South Shore" as a way to distinguish itself from Indian Rocks Beach, the town of Indian Shores was incorporated in 1949 and changed its name in 1973. Despite its small population (1,400) and limited extent (19 city blocks long and 1 city block wide), Indian Shores provides plenty of entertainment for its visitors. 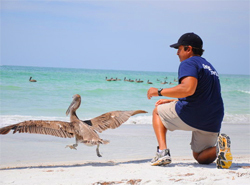 The largest non-profit wild bird hospital in the United States, the SunCoast Seabird Sanctuary, is located in Indian Shores. The sanctuary houses and treats injured pelicans, herons, egrets, owls, hawks and other birds. Many other activities such as adventure golf and boat rentals are within an easy drive. Indian Shores is also home to some fantastic restaurants. No trip to the area would be complete without a visit to the famous Salt Rock Grill. Weather permitting, sit outside on the waterfront deck and enjoy the view. Other restaurants and bars in Indian Shores include The Hungry Fisherman, Chateau Madrid and The Pub Waterfront Grill. If you want to experience what a Key West style bar was like in the days of Ernest Hemingway, visit Mahuffer's (a.k.a Sloppy John's) on Gulf Blvd, just north of the Park Blvd bridge. Self-described as the "wurst" place on the beach, with lousy food and warm beer, Mahuffer's has received numerous accolades from HGTV, the Travel Channel, Travelocity, and has been named Best of Tampa Bay two years in a row. Worth a visit, even if you decide you don't like it. See complete list of Indian Shores restaurants. Families and couples seeking a relaxing place to enjoy the beach and good food should consider Indian Shores as their next vacation spot.